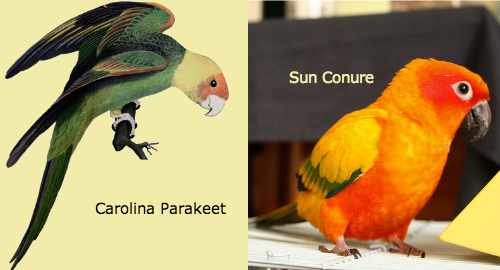 Obviously I don’t expect everyone to be able to identify a sun conure after flipping through an ornithology book for 3 seconds — and it wouldn’t have been a terrible guess — but I’m sure that the very first thing a bird book would say about the Carolina Parakeet is that it is, sadly, an ex-parrot. The attention to detail to that show is pretty impressive. House of Cards has nothing to do with parrots and I think the whole point of the bird in that episode (minor spoiler alert!) is only to set up a scene where Underwood is wrong about something, so there’s no real point to quibbling about the lack of enrichment activities in the parrot’s cage or that the kitchen might not be the best place for an animal with a very delicate respiratory system. I just thought it’d be fun to point out what I bird nerd I am. Aside from that, House of Cards is a really great show and you should go watch it. I find it hard not to laugh at the comments made by people without parrots (PWP). I hold it in so I don’t appear rude. When I’m talking on the phone and the person on the other end starts laughing at something Katie (CAG) says in the background, I wonder what’s going on since I’ve tuned her out for my phone call. Then–I can join the laughter.